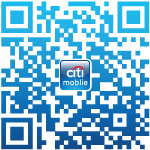 If your mobile is not iphone or Andriod phone, please visit http://mobile.citibank.com.cn via your mobile browser. If you are using Android phone, please install after downloading App to your mobile phone. If your QR code scanner is not applicable for Citi Mobile App, e.g. WeChat, please copy and paste below hyperlink on your mobile browser.